Playing hockey at UMBC has helped me grow so much as an individual and as a leader. The people I encountered playing hockey are a huge reason why I am heading to medical school this fall. Ryan Atkinson has excelled as a scholar-athlete at UMBC, and also as a scientist. 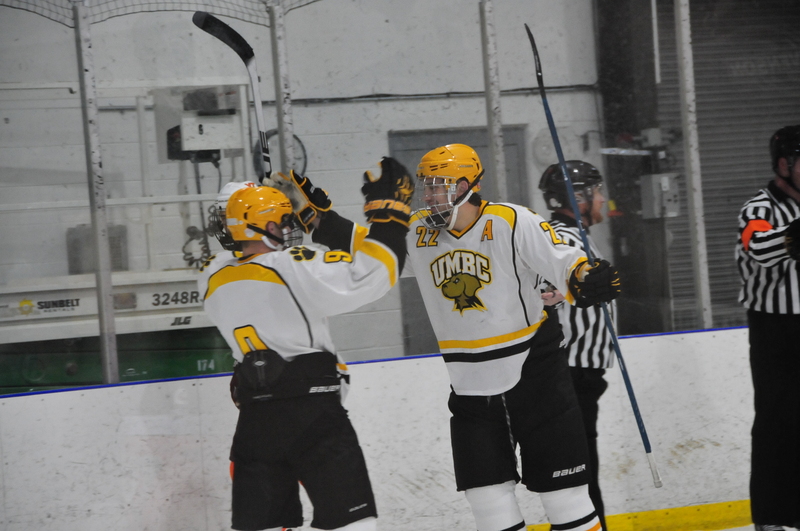 Atkinson served as captain and president of UMBC’s club ice hockey team during his junior and senior years, receiving UMBC Club Sport Athlete of the Year and league MVP honors, as well as the 2016 Lou Cantori Award, given to an outstanding UMBC scholar-athlete in a club sport. Ryan Atkinson (#9) with club ice hockey teammate Jean Luc Durantaye; photo courtesy of Atkinson. While competing, Atkison also maintained a 4.0 GPA and contributed to two journal articles based on his research in Suzanne Rosenberg’s immunology lab. This fall, he will head to the University of Southern California School of Medicine on a U.S. Air Force Health Professions Scholarship.